13:30 – US – Retail Sales / Core Retail Sales (Nov) – Retail Sales is the foremost indicator of consumer spending, which accounts for the majority of overall economic activity. Given that December’s Fed meeting is only a few days away, all eyes will be on this important barometer of economic activity. The market will be looking for 0.2% mom rise, up from 0.1% in October. 13:30 – US – PPI (MoM) (Nov) – The Producer Price Index (PPI) measures the change in the price of goods sold by manufacturers. The last 2 months have seen a drop in PPI due to weaker commodity prices. The final demand PPI is expected to be unchanged from October, a turnaround from -0.4% mom in October. A further decline might catch the Fed’s eye. 05:30 – China – Retail Sales, Industrial Production & Fixed Asset Investment (Nov)– Saturday’s data is expected to highlight how the government’s efforts to restructure the economy are impacting the economy: retail sales are expected to rise 11.1% yoy, a slight acceleration from +11.0% yoy in October, while industrial production is expected to languish at 5.7% yoy, also a slight improvement from the previous month (5.6% yoy). Outlook for ZAR: stay away! I’ve been discussing the commodity currencies recently, with one big exception: the South African Rand (ZAR). 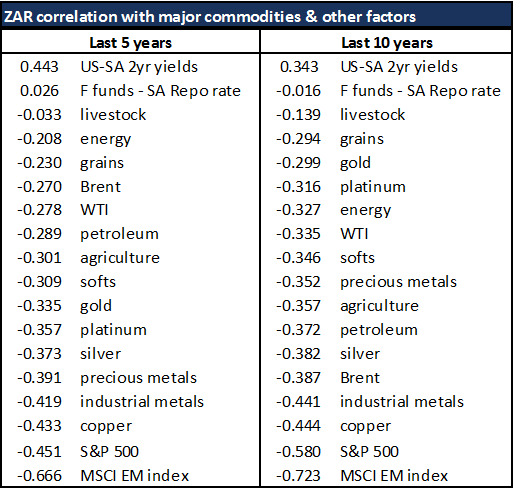 That’s because even though the South African economy is definitely dependent on commodities, its commodity mix is different than other countries and the behavior of the ZAR is different than that of the other commodity currencies. Today I’d like to discuss the ZAR and its outlook. The strongest correlation is clearly with stock markets, notably the MSCI Emerging Market stock market index but also the S&P 500. As such, it appears that ZAR is a typical growth-sensitive EM currency. It is more sensitive to movements in industrial metals than precious metals, even though South Africa is most prominent as a producer of the latter. The spread between official interest rates in the US and South Africa is little use in determining the exchange rate. The two-year spread actually works in reverse: that is, the ZAR tends to weaken against the USD when the spread is the widest. That suggests more that the spread is driven by the FX rate rather than the FX rate being influenced by the spread.